‘Bowl’ meals, or ‘buddha’ bowls, are something hubby and I eat a lot! Why? Because they are so.dang.easy. Plus, we get to use whatever odds and ends are floating around in our fridge. Waste not, want not right? What’s the Best Tofu For Frying? Firm tofu is the best tofu for frying. Don’t use silken or regular tofu. Firm is what you want. It doesn’t have as much water content as, say, silken, and allows the tofu cubes to crisp up nice and golden brown. Ain’t nobody got time for floppy, soggy uncrispy tofu. 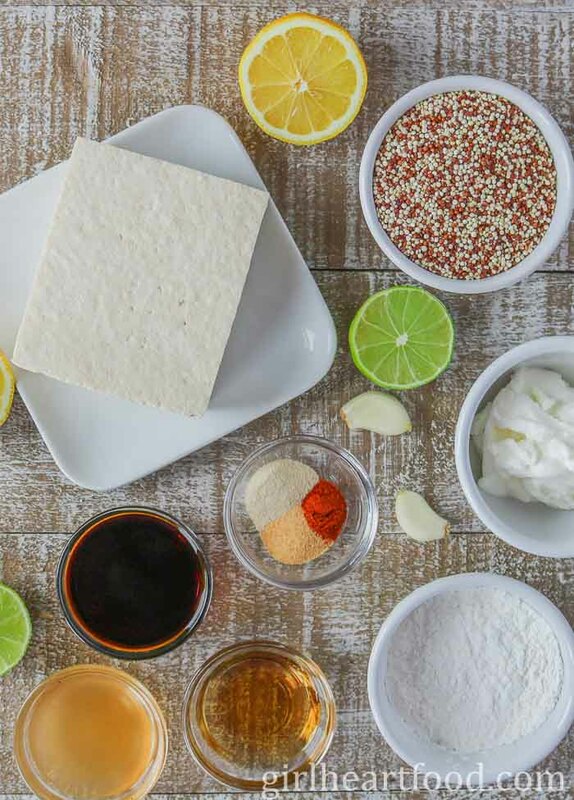 The Kitchn has a great guide for learning more about the various types of tofu. Cut block of (firm) tofu in half. 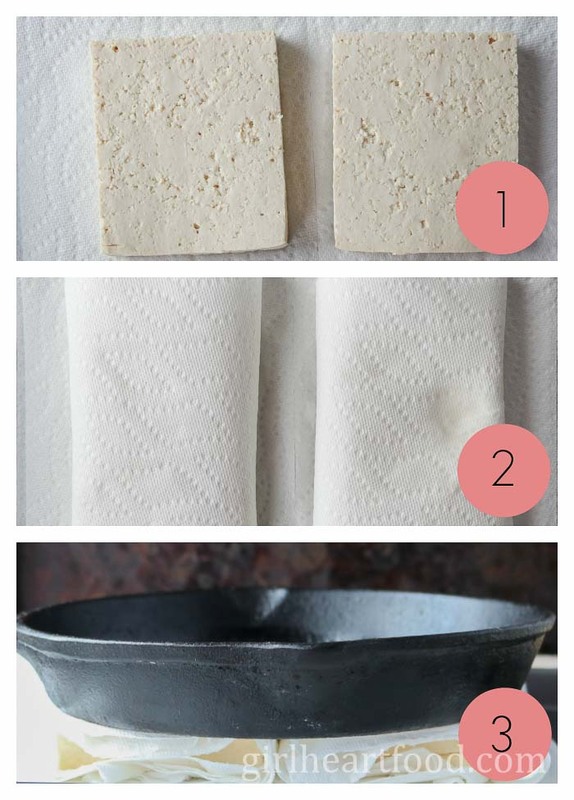 Wrap each half of tofu in paper towel (multiple layers, like 4-5). Place something heavy on top, like a cast iron pan or some heavy cans (like a canned tomatoes or the like). Allow to sit for at least 30 minutes before unwrapping and proceeding with recipe. If you want even more moisture removed, halfway through pressing, remove paper towel and replace with fresh stuff. How to make tofu taste good? It’s easy peasy…marinate it! After you’ve pressed excess moisture from the tofu, I love to marinate to give extra flavour. Tofu by itself is not flavourful and pretty neutral tasting, which is not a bad thing! That just means it can take out whatever flavours you want it to! 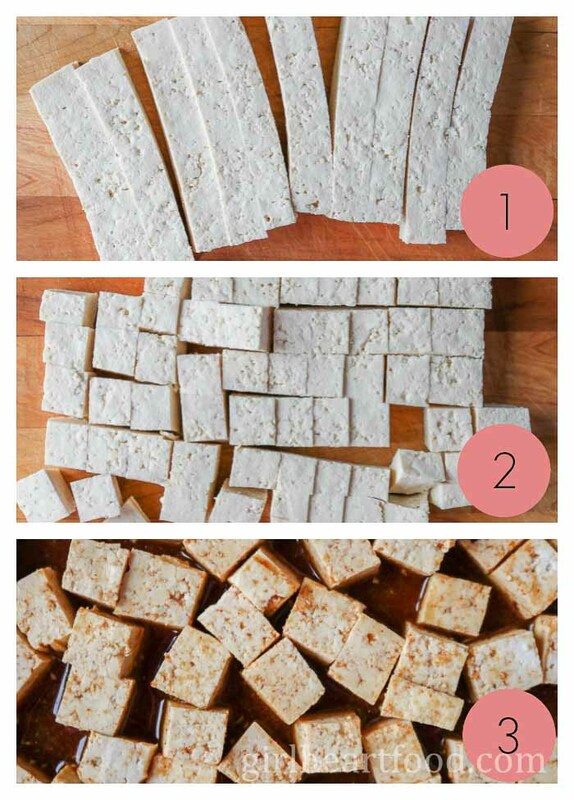 Cut pressed tofu into strips. Place in marinade, stirring to coat. Allow to marinate for at least 15-30 minutes, stirring occasionally. How to Cook Tofu? How to Make Crispy Tofu? 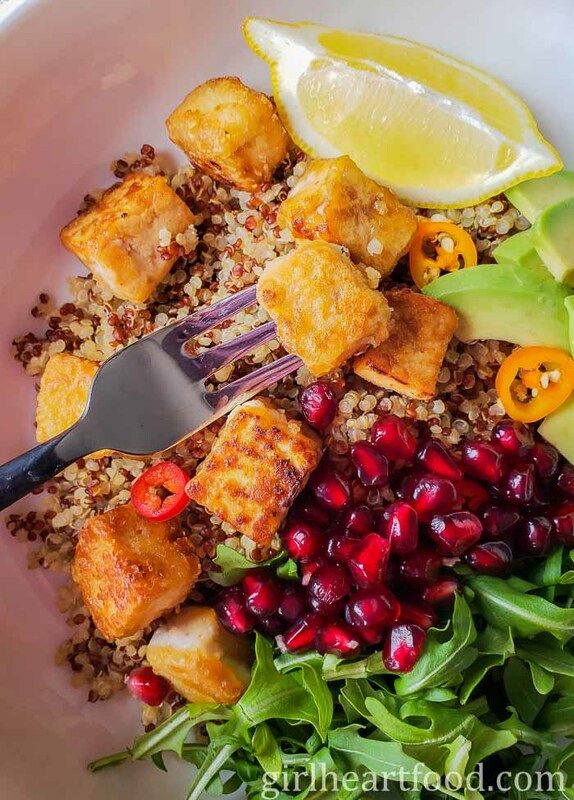 There are so many ways to cook tofu – simply pan fry it, scramble it, grill it or make crispy tofu (like I did for this quinoa bowl). After the tofu has been pressed and marinated, now let’s make crispy tofu. Honestly, you guys, I could pop these little bite-sized pieces like candy. Remove tofu from marinade, shaking off excess. Dab a little dry with paper towel, if you like. Place half of the tofu into a plastic bag and sprinkle in 2-3 tablespoons of cornstarch, shaking to coat. Repeat with remaining tofu/cornstarch. Ensure excess cornstarch is shaken off (I like to put them in a sieve to remove excess). In a large non stick pan on medium low heat (working in about 2 batches), add half of olive oil (1 tablespoon) and add half of tofu. Cook tofu on all sides, turning as necessary, until golden brown and crispy. 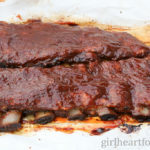 Remove from pan and lay on a baking rack or plate while preparing second batch. 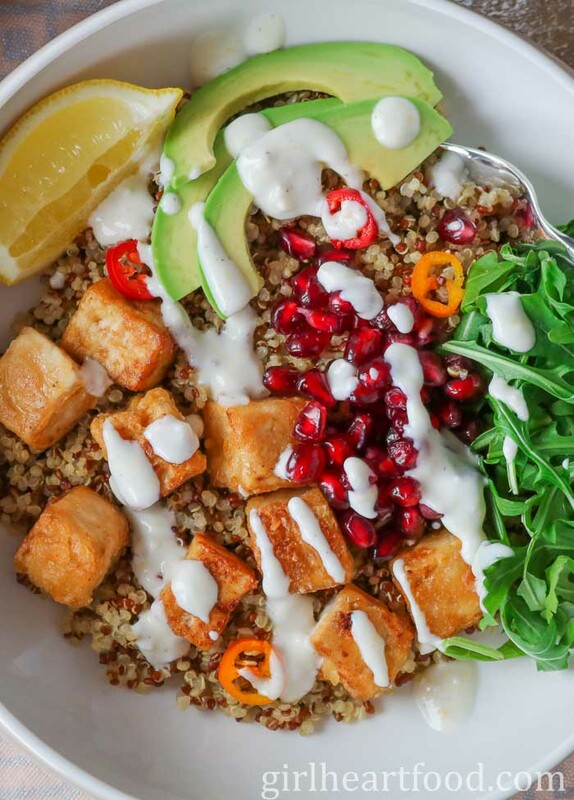 For these easy quinoa bowls, I made a super simple yogurt sauce to drizzle over top. Honestly, for the photos, I went a little easy. After? I piled it on, lol. It’s garlicky, lemony and straight up creamy deliciousness. I used 1 cup of uncooked quinoa (which yields about 3 cups cooked). For me, it’s plenty for 4 servings. However, if you want things a little more substantial feel free to cook more. If you are making this for meal prep, I would suggest not cooking the tofu until before serving. It’s best (i.e. crispiest) when freshly made. Like mentioned above, coat the tofu in batches and ensure the excess cornstarch is shaken off. If not, the tofu will not get the best possible crispy exterior. Try another base like couscous, rice or bulgar. 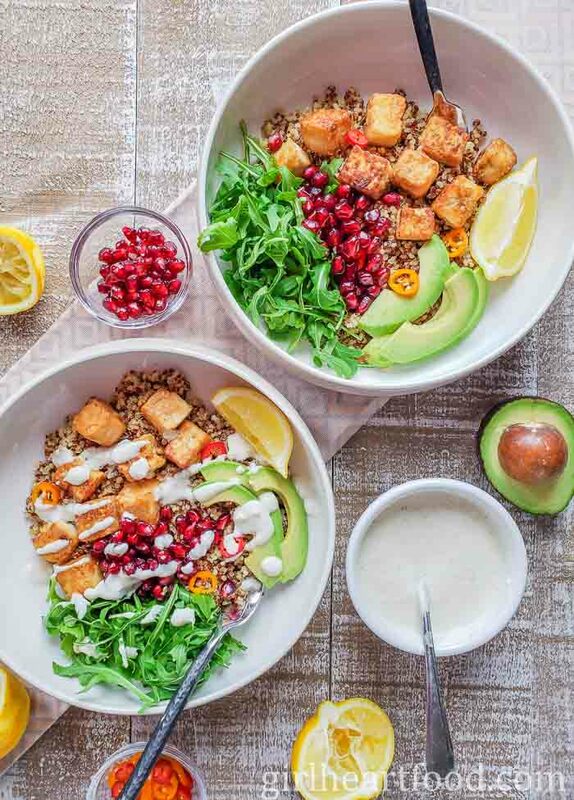 Hope you love these tofu bowls as much as we do! 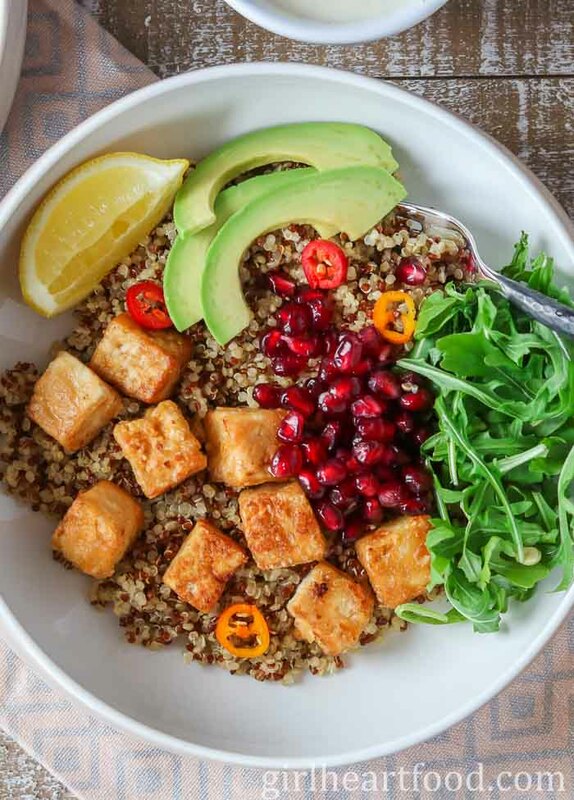 A fluffy quinoa base, crispy tofu and lots of garnish like sweet pomegranate, creamy avocado and vibrant arugula makes these Crispy Tofu Bowls a super satisfying lunch or dinner! Combine all ingredients in a bowl until mixed. NOTE: start with 1 clove of garlic and taste if it's enough for you. Add another if you like things really garlicky. Cut block of tofu in half. Wrap each half in paper towel a few times. Lay on a plate or board that has been covered in paper towel. Place something heavy on top of wrapped tofu, like a cast iron pan or heavy can. Allow to dry out for 30 minutes. After 30 minutes, unwrap tofu. Place all marinade ingredients in a baking dish and stir to combine. Cut tofu into strips and then dice into little cubes and place into marinade, moving around to coat. Allow to marinate at least 15-30 minutes, stirring occasionally. Remove tofu from marinade. Shake off excess marinade and pat dry a little if necessary. Place half of the tofu in a plastic bag and sprinkle half of the cornstarch over top (about 2-4 tablespoons). Shake to coat. Ensure excess cornstarch is shaken off by placing cubes of tofu in a sieve. Repeat with remaining tofu and cornstarch. In a large non stick pan (working in two batches) heat 1 tbsp of oil over medium low heat. When oil is hot, add half of tofu. Cook until golden brown on all sides, about 6-8 minutes per batch. Place browned tofu on a rack, sheet or plate while cooking second batch. 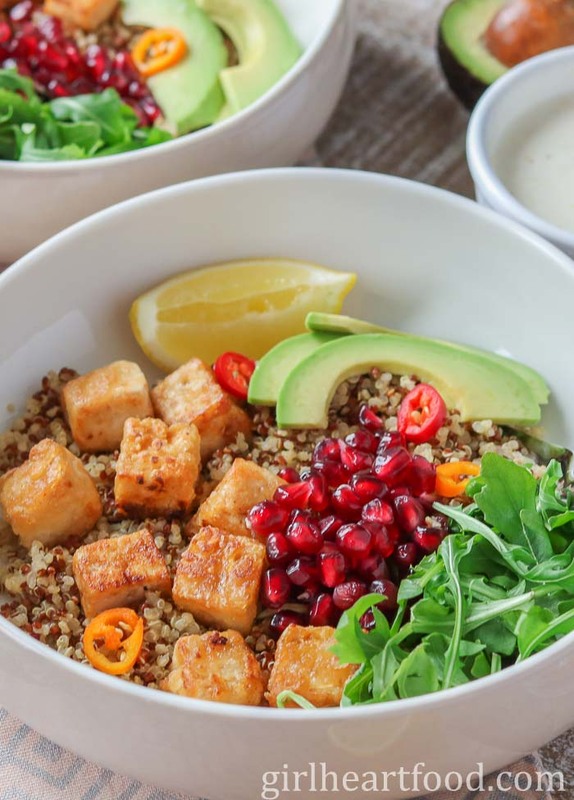 Distribute cooked quinoa among bowls. Top with tofu and garnish. Drizzle with sauce. Enjoy! Cook it crispy and hard to tell its tofu! These bowls are perfect for busy weeknights! Girl, you know how I feel about loaded bowls! So much goodness! So easy! So delicious! This one is no different! That garlic lemon sauce is calling my name! 🙂 Happy Tuesday! What a great looking bowl – perfect for lunch or dinner! I think you’ve hit just about every element – crunchy, sweet, sour…. This looks delicious! Usually, I avoid Tofu but it looks so delicious in these clicks I’d love to give this recipe a try! So happy to hear that 🙂 Thank you very much! Dawn, these tofu bowls look fabulous! I love a healthy bowl! Really appreciate your tips on tofu as I don’t have much experience in that area and it looks really delicious when it’s crispy! Thanks so very much for the kind comment, Kelly! What a beautiful bowl, Dawn! I love the vibrant colors and array of flavors! And that sauce, YUMMM! I go back and forth on tofu, but this one looks and sounds pretty tasty! Thank you very much, Laura 🙂 It’s a yummy one for sure! You know, I haven’t made tofu in years. It’s not that I don’t like it – I do! – I just got out of the habit, I think. We love “bowl” meals, though. I also love to pile on the sauce – if that’s wrong, I don’t wanna be right! This looks so vibrant and delicious, Dawn! Ohh! Loving these super versatile, delicious bowls, Dawn! I see why you and your husband eat a lot of them – SO good! You know, tofu is one of those things that I just haven’t gotten behind yet. But then again, I don’t think I’ve ever tried crispy tofu. The tips in this post are excellent, though. I might have to break down and give it a shot! Also, I love all of the flavors you’ve layered into this dish. Quinoa is an excellent base, and the pomegranate arils are a fun addition. Hope you have a great Monday, my friend! 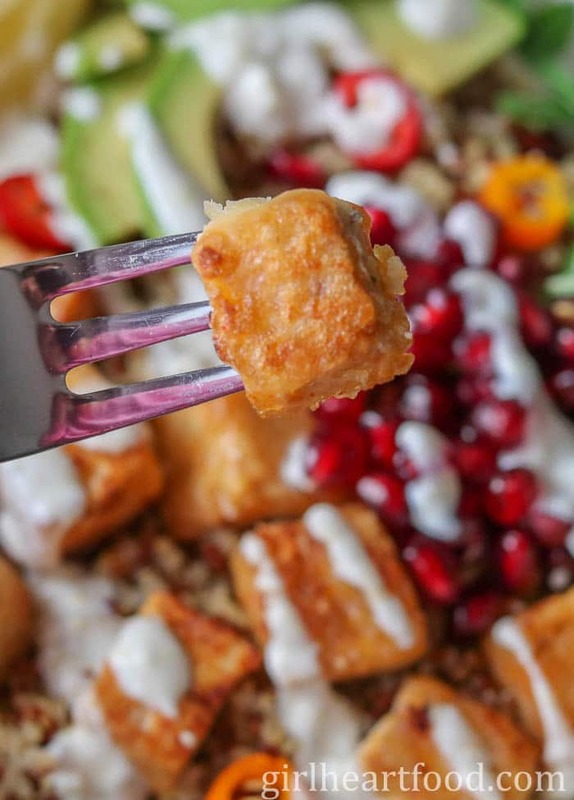 Try crispy tofu and you won’t look back 😉 Thanks David! You too! So beautiful and vibrant! I love every single ingredient you’ve selected to accompany the tofu and that yogurt sauce is right up my alley! Love it all – pinned! I’m going to fess up Dawn, I’ve nevr tried tofu. I’m kinda scared actually and I don’t say that quite often. This bowl does look delicious though. If I get up my nerve, I’ll let you know! Don’t be scared! It’s easy to prepare and delish! Hope you get a chance to try out 🙂 Thanks Mary Ann! Tofu is not one of my favorite things–unless it’s crispy and then I’m all over it :). I love the sound of the dressing too. Anything with garlic and lemon must be good! Have a great week, Dawn! Gotta love that crisp factor 😉 Thanks Kelsie! You too! This looks like a perfect lunch. I haven’t bought tofu in quite a few years. Now I need to run out and go get some — I love what you’ve done to it here! Yay! Happy to hear that 🙂 Thank you Mimi!